As no stranger to the ICT, Dr. Somma, completed her residency through Wichita State’s Advanced Education in General Dentistry program. She developed a passion for dental surgery through her clinical experience in endodontics and dental implants. Dr. Somma is committed to lifelong learning and has gained her talent too, from working with several local experts in the industry. 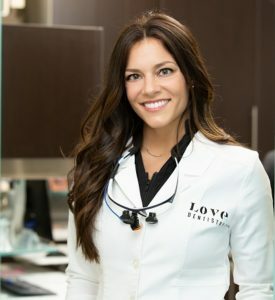 Originally from Fort Lauderdale FL, Dr. Somma achieved her Bachelor’s in Biology at Florida International University and attended dental school at Midwestern University in Illinois, graduating at the top of her class. Dr. Somma volunteers through medical missions each year and is passionate about giving back to the community. When not at work, she enjoys spending time with her newly engaged fiancé Bret, friends, family and adorable puppy, Decker. She enjoys an active lifestyle and has been focusing on Spanish as her second language. Dr. Love and Dr. Somma’s shared focus in cosmetic dentistry and vision to create healthy, strong and beautiful smiles sets our patient care above the rest. We are so excited for the opportunity to have another dentist on board to provide a more expanded level of care to our patients!